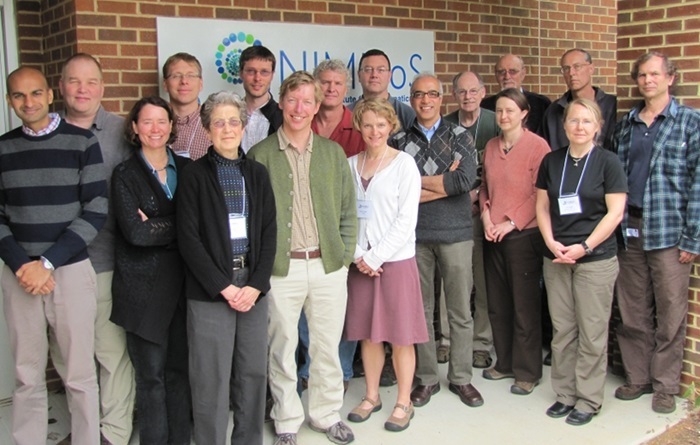 The North American Bat Monitoring Program (NABat) working group was hosted by the National Institute for Mathematical and Biological Synthesis in Knoxville, TN, to design a program for coordinated bat monitoring across North America. Front row: (L to R) Tushar Kansal, Laura Ellison, Susan Loeb, Tom Rodhouse, Kathi Irvine, Subhash Lele, Robin Russell, Cori Lausen. Back Row: (L to R) Tom Ingersoll, John Reichard, Matthew Clement, Tom Stanley, Wayne Thogmartin, Doug Johnson, Tom Hallam , Patrick Field, and John Sauer. Loeb, research ecologist with the Forest Service Southern Research Station upland hardwoods research unit, led the effort to develop NABat. With assistance from core team members from the National Park Service, U.S. Geological Survey, U.S. Fish and Wildlife Service, U.S. Department of Defense, Canadian Wildlife Service, Wildlife Conservation Society Canada, and Bat Conservation International, Loeb organized four workshops to develop monitoring protocols, edited and wrote chapters for a Forest Service General Technical Report to be published this spring, and presented at national and international meetings. NABat grew out of a national working group chaired by Loeb and originally charged with developing monitoring plans and protocols to gauge the impacts of white-nose syndrome on bat species. Working group members quickly recognized that monitoring is also needed in relation to other stressors such as wind energy development and climate change, and that effective monitoring needs to be geographically extensive and international in nature. The result of their efforts, NABat, is a multi-agency, multi-national effort designed to address the lack of large-scale long-term monitoring data for North American bat species by developing a comprehensive bat monitoring program to track changes in the distribution and abundance of all 47 North American bat species that are shared among the U.S., Canada, and Mexico. Several states and provinces have already started using the NABat design and protocols to begin monitoring bats. During 2014, NABat pilot programs started in Arkansas, Arizona, Colorado, Delaware, Idaho, Missouri, New Mexico, Rhode Island, and South Carolina in the U.S., and in Alberta, Newfoundland, and Prince Edward Island in Canada. This year programs will begin in new states and expand in some of the states with pilot programs. Read an interview with Susan Loeb by Bat Conservation International.